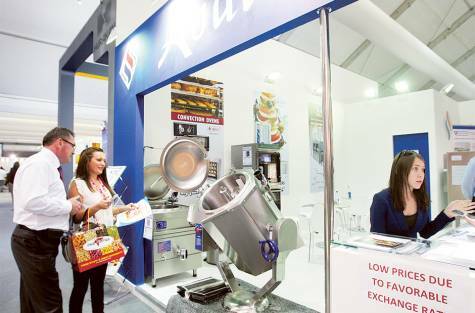 Dubai: Russian food and hospitality companies at Gulfood 2015 are keen on doing brisk business in the Gulf Cooperation Council (GCC) countries amid a weak rouble. “We want to increase our business in the Middle East. We want to find new clients in new countries where we can sell our products,” said Dmitriy Volobuev, commercial director at KZP Group, which exports wheat and barley. The rouble has been tumbling since last year amid lower oil prices and Western sanctions against Russia over the country’s involvement in Ukraine. It has fallen by almost half against the dollar over the last year and by around 5 per cent over the last month to 0.0151. All of the GCC countries’ currencies are pegged to the dollar except for the Kuwaiti dinar. Volobuev said that KZP Group, which operates in 70 countries worldwide, “makes much more profit because of the cheap rouble.” He expects the company’s grains exports to increase by around 20 per cent this year compared with last year, when it exported one million tonnes of grains. KZP Group signed two contracts with buyers from India and Pakistan at Gulfood 2015, which is one of the region’s biggest food and hospitality trade shows. Meanwhile, Irina Ishaleva, marketing manager at Abat, a kitchen equipment manufacturer, said she is participating at Gulfood to look for distributors in the GCC. She said that distributors in the region would be interested in her company’s products since prices are now “twice lower than competitors in the UAE”. The manufacturer has operations in Commonwealth of Independent States (CIS), Latvia and Lithuania, aside from Russia. It does not operate in the Middle East. The sanctions imposed on Russia by the West, a tumbling rouble and a ban on Western food imports have resulted in inflation in Russia, hitting prices of staple food items. Moscow said it will impose a tax on grain exports from February 1 to June 30 to curb prices on its domestic market. The tax amounts to 15 per cent of the price per tonne, plus 7.5 euros, with a rate of at least 35 euros per tonne. The instability in Russia has also affected outbound tourism. The drop in the rouble has kept some Russians from travelling abroad. The UAE, for instance, has seen a drop in Russian visitors since the previous year. Most Russians visit the country during the winter months. Новые видеоматериалы на сайте - конвекционные печи, комплекты ТРИ-В-ОДНОМ, котлы серии ОМР!